#4 Neslihan K. Hidirligil, 37 ? Founder & CEO, N&F Global Corp.
Perhaps few Americans know that Santa Claus was from Demre, a town and its surrounding district in the Antalya Province on the Mediterranean coast of Turkey. But it’s a well-know story that in major American cities, such as New York, Washington, DC, and Boston, the largest all year long Christmas gift stores are owned by a Turkish entrepreneur. How crazy is that business idea, of selling Christmas gifts all year long at huge retail locations? It’s a seasonal occasion and nobody had ever dreamt about it except one young entrepreneur, Neslihan Kocabaş Hıdırlıgil. 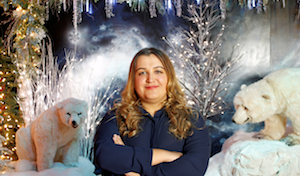 By the age of 23 in 2002, she was already a small gift retailer, and in 2004 Neslihan discovered her true calling, bringing Christmas to consumers all year long. She found great joy there in connecting with customers from all over the globe. As founder and CEO of N&F Global Corporation, she created a business vehicle to run multiple stores. She opened their first store, a 700-square-foot one, in the Broadway Mall in Hicksville, NY. By 2007, she had retail operations in a dozen seasonal-only locations, and her pride and joy were her two year-round Christmas stores, at Faneuil Hall in Boston, and South Street Seaport in NYC. The company’s mission statement is to make everyone who enters feel the spirit of Christmas all year. The Seaport store was the largest continuous Christmas shop in New York, carrying more than 1200 Christmas products. Neslihan became famous for the visual wonderland she created wherever she opened, even in the seasonal locations. When the Seaport was devastated by Hurricane Sandy in 2012, forcing closure of the center for rebuilding in 2013, Neslihan responded by moving her flagship operation to Mulberry Street in nearby Little Italy, with about ten times the square footage with 18,000 square-feet of space. Customers wander through different displays of NYC landmarks such as Central Park, the Empire State Building, Yankee Stadium, etc, on the ground floor. Neslihan also designed her own audio-animatronic exhibit for the basement, with twelve scenes that tell an original Christmas story called Grand Central Santa. This store even has a Mrs. Claus’ Café, with beverages and desserts in Noel themes. While Neslihan carries a wide range of Christmas products and collectibles from all major designers and importers, she designed and manufactured hundreds of her own proprietary N&F Global ornaments, which are the heart and soul of her stores now. N&F Global Corporation is a pioneer in its industry. In 2014, Neslihan was the cover story in Specialty Retail Report magazine, and in 2015 she was the feature story for Selling Christmas Decorations magazine. She was given a Silver Stevie Award in 2015, and she will be honored as a national award winner on March 1, 2016 by Enterprising Women magazine. Neslihan Kocabas answered TURKOFAMERICA’s questions. Could you tell us when you came to U.S. and what was your aim and how you started a business? How did you get your idea for the business? I came to the United States in 2002 as a student. After my college graduation in Turkey, I wanted to improve my English, and to get a graduate level education in America. My original plan was to get a master's degree and then go back to Turkey. However, things went differently than I expected over here. First of all, I fell in love with America, and secondly I fell in love with the man that I would marry, who is also Turkish. America was very different than Turkey! Everything seemed so different, and those very differences are the things that attract many young people from all over the world. They attracted me as well. The American way of life is so practical and simple. I felt that people treat you for what you do, not for what you are! People did not care about what your ethnicity was, or religion, or gender, or etc. If you have a talent or a passion to do something, opportunities will follow you here. Doors open for you if you are hard-working, honest, respectful of the rights of others, and if you contribute your talent to this community. New York City especially seemed to be a Land of Opportunity for me. Some opportunistic people do try to take advantage by taking without giving, and even if these kinds of people do get some small things from this country, I am pretty sure they will not be here for long. I think deciding to come to the United States was the smartest decision in both my personal life and my business life. I got married here to my Prince Charming, Fatih, and I started a career here that I also love. I do not know if I could have had the same opportunities in Turkey. I started in the retail business, selling gifts in a mall. I saw that the greatest customer demand was for Christmas products, so I began to specialize in that field. It was an extremely positive experience sharing the Christmas spirit with people. I knew then that I wanted to develop this business as my career. I did many seasonal operations until I opened our first year-round Christmas store in 2006. For my first two locations I chose South Street Seaport in NYC and historic Faneuil Hall in Boston. I think that good competition is a must for every business. It helps you to improve yourself, it keeps you updated, and it keeps you dynamic. We created a completely new retail concept. There are some companies which try to copy our concept, but copying is not the same as competing. I call them our “followers”, because by copying they will always be behind us. They have no original ideas of their own. Our approach is to offer a product line that is exclusively designed and produced to be sold in our stores. I think this is our biggest advantage, and I have myself created hundreds of ornament styles for this purpose. Followers cannot take the shortcut of trying to copy what we buy, because we produce the product ourselves, and they cannot buy it. Designing new styles for customers requires a lot of experience, a lot of work, and a lot of talent. Also we took the more costly and time-consuming approach of decorating each store differently, while most companies cut costs by making cookie-cutter displays that they use everywhere. Each of our locations has a boutique style, and each is decorated uniquely for its home community. We do not want to give the same style to all of our stores, so that every one of our stores offers a unique shopping experience for our customers. It is not the boring, same everywhere, “one size fits all” approach of franchise stores. This makes our stores a destination shopping experience that all customers enjoy. Besides these reasons, I love my job and work 24 hours a day. I think that is another advantage we have, and none of my competitors or followers can compete with me in how much I love what I do! We have a professional team for location selection. When we are considering a new store in any location, they do all the analysis and prepare a detailed report for the venue. I have the team evaluate the traffic count and report all the data they can get on comparable store sales and costs there. I use their input to estimate projected revenues costs, and I decide on the locations according to the likelihood of running a successful operation there. We are so well known in the industry that property management companies are eager to offer us opportunities all over North America. They come to us to offer new locations, and we also explore options on our own. We generate extraordinary customer satisfaction, so we are able to select the best locations and negotiate the best deals because the locations want us. If you were to do anything over again, what would you do differently? I think I am a very happy person. I cannot think of anything I would want to change in my life. I think all the incidents in our lives are important learning experiences for us. Sometimes we think some decision was a mistake, but in reality that mistake might have been the best way to teach us what not to do. If I did have the opportunity to go back in time I would love to do the same things again. What was your "scariest" moment and what was the solution? I know that my scariest moment was when my husband had a life threatening surgery in 2013. I found out that the only solution was to trust in God and pray. I realized that sometimes even people who are used to handling all kinds of situations can run into something beyond their control. At that point, we have only one thing to do, which is to pray to God and to trust God to handle what we cannot control. Both my husband and I come from families that are active businesspeople in Turkey. Their example inspired us to explore this career, and we came to New York, a city in the center of global business. We love this as our life work, so we had no reason to seek any other kind of life. I can say we followed our faith in business, and it has rewarded us with satisfaction and success. I like to travel, so when I get a chance I love to see different parts of the world. I like photography, so that is a hobby. I read a lot! Books are so precious to me. Also, I enjoy going to the theater, concerts, and shows regularly. Because I am a full time mom, my free time schedule has been shaped by my handsome boy for the past seven years. If he wants to play soccer, we go play soccer, and if he wants to go wrestling, then we go wrestling. I try hard to match my interests with his interests, to keep our family close. We all like to go swimming in summer and skiing in winter. Running a business should not exclude family; I have always included my son in our business trips, and he also loves what we do. I think people who sacrifice their family time for non-stop business are making a mistake, and success in business should not be at the expense of family quality. Technology companies are my favorite to admire. I believe some traditional businesses are outdated and will no longer be viable soon. Technology will replace or re-shape many of the traditional businesses eventually. Every industry, even including service, health, retail, etc, needs to conform to new technology in order to continue. I think it is our very near future to be transformed by technology. That’s why I closely watch the technology companies. Also I am interested in the stock market. I closely watch the stock markets (my favorites are still technology companies:)) as well. I really don't know on average, but I think about the business 24/7. Because it is always on my mind, I may get an inspiration at any time of day or night. How many branches and employees do you have? What is your aim for next five years? The number of operations varies with seasonal additions to our year-round stores. We have operated stores in different cities and states, including New York, Boston, Los Angeles, New Jersey, Washington, DC, Miami, St. Louis, etc. We also have international operations in Canada, and plan to open in Italy very soon. For the next five years, we will continue to improve the quality of every operation as well as to increase the number of locations in which we operate. We don’t have a specific corporate goal. Our ornaments are already hanging in homes in every country in the world, and our stores have hosted visitors from the entire globe. Our company mission is that every visitor should feel a personal connection to the Christmas spirit when they enter any of our stores. Our company is a pioneer in our industry, always introducing new innovations to the shopping experience. I want us to continue to be considered the best in the business in display, products, attractions, and customer service experience. Would you like add anything? As an immigrant woman, I have had many challenges here, but I always feel that I have a safe home back in Turkey. Even though we do not live there anymore, Turkey is very special to us and we have great love in our hearts for our homeland. When we first left Turkey, we felt that we had to leave our country because of economic problems, political problems, etc. We experienced a "28 February" trauma. I am talking about 2001, and the period before and after it. I do thank God that Turkey is much different now! I do not see now the same conditions which pushed us to move away to here back in 2001. I think Turkey has improved incredibly since then. I think Turkish people need to understand of the value of this development. I have been to many countries, including very developed ones. Turkey now has a great potential, and this could be a very positive trend to improvement. Young people have a much greater opportunity to contribute there now. I am concerned that some people may still judge from the past. I suggest that everyone should consider the value of what they have in their hands before they discard it. I watch Turkey from here, and it seems to be strong despite each global economical crisis. Turkish people are strong and resilient, and I think they succeed in riding out these crises better than most. I think Turkish citizens now can be thankful for what they have. If we get good news from Turkey when we wake up every morning, we are very happy. If we see some bad news from Turkey, even though we do not live there anymore, it makes us very sad. So please please please just take good care of my country.